I was on the phone this week talking to a customer about different options in print. He was interested in the discussion because he felt they needed to do more non-traditional marketing. Just think about that for a second… print is non-traditional marketing. That’s where we are today. Blogging, social media, web articles… that’s all very traditional. Now, am I saying that brands should be looking at print as an opportunity right now to get and keep attention? Yes, that’s exactly what I’m saying. 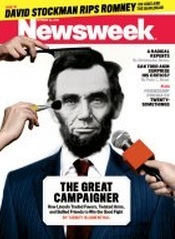 I’m sure you heard the news that Newsweek magazine is ceasing publication in the print format. SmartMoney recently made the same declaration. When I have conversations with marketers and publishers about these kinds of moves, I always hear the notion that “print is dead.” Well, I’m here to tell you that there has never been a bigger opportunity for brands in the printed channel than right now. While I would not want to be in the broad-based, horizontal print game (ala USA Today), highly niche, highly targeted publications are flourishing as a marketing tool. For example, thinkMoney magazine from TD Ameritrade sees about 90 percent of its customers take direct action on a product it sells through the print magazine. The magazine is a true collision of amazing design and provocative information. It’s the type of content that is anticipated by its trader audience. And better yet, since traders are in front of computers all day long, they look forward to the opportunity to disconnect and discover. 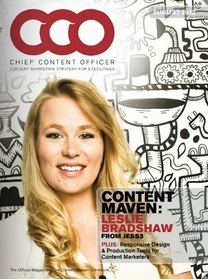 Even our own Chief Content Officer magazine has a clear competitive advantage in the marketplace because it’s in print. At a recent event (not ours), three marketing executives came up to me and told me how much they enjoy the magazine and can’t wait until the next one arrives (they didn’t mention our daily digital content… they just mentioned print). Most prognosticators say that by 2020 most printed media will be gone. I think anyone who makes those types of comments doesn’t understand history. Just type into Google “The Death of TV” and you’ll see hundreds of articles predicting the end of television. One could make the argument that right now is the golden age of television, with amazing shows like Boardwalk Empire, Mad Men and Homeland leading the way. The evolution of the internet doesn’t kill off these channels… it makes us look at them differently because they are used differently by consumers. We are releasing our third annual content marketing study next week. Among the findings, the usage of EVERY channel is flat or up. After years of seeing the usage of print magazines on the downside, we saw no change year-over-year. Yes, marketers, for the most part, have stopped fleeing from the print channel. Of course, content marketing strategy comes first, followed by channel strategy. But as a content marketer, it is our responsibility to look at all available channels to tell our stories. 2. Its focus on customer retention: Sixty-four percent of B2B marketers create original content for customer retention and loyalty goals Historically, the reason why custom print magazines and newsletters were developed by brands was for customer retention purposes. In a recent CMI webinar, Carlos Hidalgo, CEO of Annuitas Group, stated that one of the biggest problems marketers have with their content is that they forget to nurture customers AFTER the purchase decision was made (we have a winner!). 3. There are no audience development costs: Publishers expend huge amounts of time and money qualifying subscribers to send out their magazines. Many times, publishers need to invest multiple dollars per subscriber per year for auditing purposes (They send direct mail, they call… they call again… so that the magazine can say that their subscribers have requested the magazine. This is true for controlled [free] trade magazines). That’s a cost that marketers don’t have to worry about. If marketers want to distribute a magazine to their customers, they just use their customer mailing list. That’s a big advantage. 4. What’s old is new again: Social media, online content and iPad applications are all part of the marketing mix today. Still, what excites marketers and media buyers is what IS NOT being done (can you say non-traditional?). They want to do something different… something new. It’s hard to believe, but the print channel is new again and is seeing a rebirth. Could we possibly be seeing a golden age in print, like we are seeing in television? The print vehicle is still the best medium on the planet for thinking outside the box and asking yourself tough questions based on what you read — it’s lean back versus lean forward. If you want to challenge your customers (like Harvard Business Review does), print is a viable option. We’ve seen this firsthand with CCO magazine. Contributors love being featured on the CMI website, but they crave having their article in the printed magazine. It’s amazing how different the perception is of the print versus online channel when it comes to editorial contribution. 7. Print lets people unplug: More and more, people are actively choosing to unplug, or disconnect themselves from digital media. I’m finding myself turning off my phone and email more to engage with printed material. A year ago I didn’t see this coming. Today, I relish the opportunities when I can’t be reached for comment. For example, our entire family does “electronics-free Saturday.” This means no computer, no iPhone, no Xbox, no email, no Facebook. We’ve been doing this since January, and although it’s been difficult, it’s been an amazing experience for our family. Just two weeks ago, all four of us were sitting in the family room reading books and magazines. We’ve also done much more together, as a family. If I’m right, many of your customers (especially busy executives) are feeling the same way. Your print communication may be just what they need. Looking for more ways to maximize the impact of your print content? Get practical insights, advice, and answers in our 2018 Guide to Essential Content Marketing Tactics.